7/8" Counter edge for the 50's look. Accepts 1/2" vinyl insert. Stocked in a silver luster finish in 12 ft. and 6 ft. lengths. 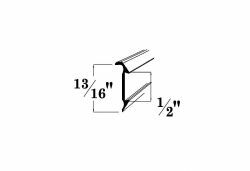 7/8" aluminum counter edging, accepts 1/2" vinyl insert, available in 12' and 6' lengths in a silver luster finish.